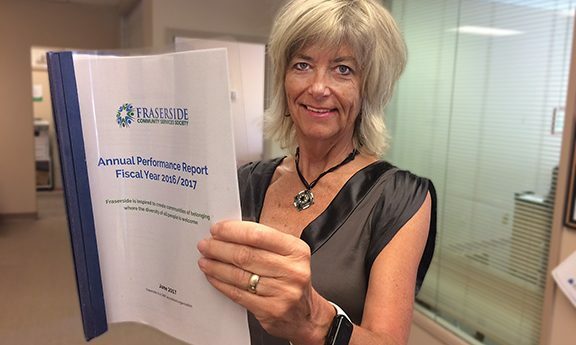 Fraserside Community Services Society met many of the performance goals it set for itself last year, according to the 2016-2017 Performance Report. Providing specific training and education in areas recommended by employees. Assisting the persons we serve achieve 84% of the goals they set regarding relationships and community participation. Working with persons served to attain 95% of goals related to housing. Conduct a comprehensive evaluation and needs assessment of Fraserside’s real estate portfolio and assessing our facility assets against the needs of the persons served. Develop a Fund Development plan, with the objective of increasing the diversity of finances to improve our sustainability. There are several more goals set out for Fraserside in the coming year. More details can be found in the 2016-2017 Performance Report Executive Summary found on our website.